LCD Media has opted to standardize on BroadSign International's digital signage software platform for retail initiatives in Denmark. 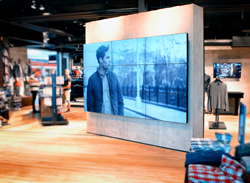 A nine panel digital signage display in a Denmark retail store. LCD Media’s primary focus is on 300 retail stores in Denmark. Its larger customers consist of PWT Group, which has 170 shops with a minimum of two players each, and JACK & JONES. Replacements consist of videowalls and LCD shows ranging from 10 inches to 86 inches, put in strategic areas to facilitate increased impressions and improved communication in between the consumer and the brand. While the objectives and kinds of content vary from brand to brand, a shop’s typical material loop lasts two to three minutes and campaigns are progressively using touch options to enhance interactivity.